Coordinators: Bayoumi Magdy A., Swartzlander E.
VLSI DSP technology : current developments. Recent developments in the design of image and video processing ICs. High performance arithmetic for DSP systems. Pipelining and clocking of high performance synchronous digital systems. High-speed transform coding architectures for video communications. Design and programming of systolic array cells for signal processing. Analog VLSI signal processors : design and test methodologies. Switched capacitor parallel distributed processing network for speech recognition. Preface. 1. VLSI DSP Technology: Current Developments, M.A. Bayoumi. 2. Recent Developments in the Design of Image and Video Processing ICs, K. Konstantinides, V. Bhaskaran. 3. High Performance Arithmetic for DSP Systems, G.A. Jullien. 4. Pipelining and Clocking of High Performance Synchronous Digital Systems, E.G. Friedman, J.H. Mulligan, Jr. 5. High-Speed Transform Coding Architectures for Video Communications, C.T. Chiu, K.J.R. Liu. 6. Design and Programming of Systolic Array Cells for Signal Processing, R. Smith. G. Sobelman. 7. Analog VLSI Signal Processors: Design and Test Methodologies, M. Soma. 8. Switched-Capacitor Parallel Distributed Processing Network for Speech Recognition, Y. Horio, H. Takase, S. Nakamura. Index. This multiauthored book is a response to the tremendous amount of research activity taking place in the field. 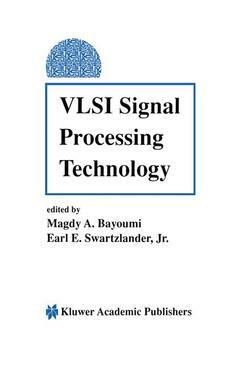 It introduces readers to the main features of VLSI signal processing, and describes ongoing developments in the area.